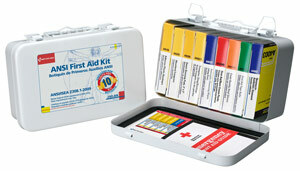 First aid kits available from Right Response are proudly built in the USA at our facilities in Vancouver, Washington. 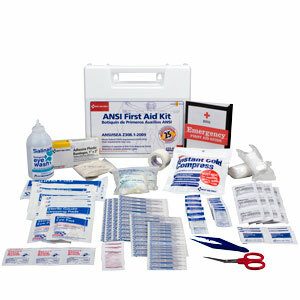 We support American jobs by purchasing the contents for the first aid kits wherever possible from U.S. manufacturers. 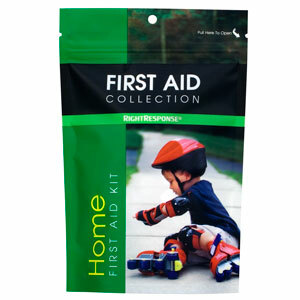 Half of each first aid kit purchased goes directly to the Frenchglen Education Foundation. Each kit features hospital-grade supplies that provide care and comfort. Using modern manufacturing techniques, all our kits are built within days of ordering. This ensures the freshest first aid available with longer expiration dates. Perfect for every room in the house. Includes exam gloves, hand sanitizer and safety pins. $12 plus $5 shipping. A must have for every sport bag. Includes instant cold compress and moleskin for blisters. $12 plus $5 shipping. Put this in your backpack for treating outdoor injuries with supplies such as alcohol wipes and insect sting relief pads. $12 plus $5 shipping. Be road ready with this easy to store kit. Features insect sting pads and wound care items. $12 plus $5 shipping. 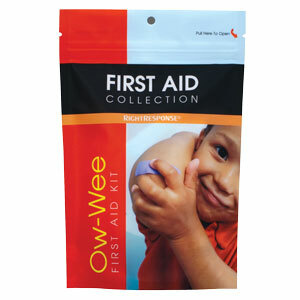 Dry the tears then fix the little hurts with bandages, wound care items and an instant cold compress. $12 plus $5 shipping. 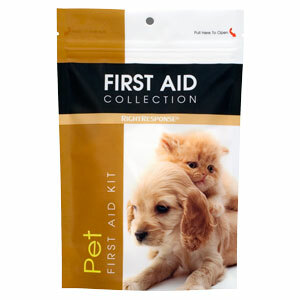 Take care of Rover and Fluffy with this unique kit featuring gauze, tape and a special pet first aid guide. $12 plus $5 shipping. Stay ready at home or away with the versatile Soft Kit. 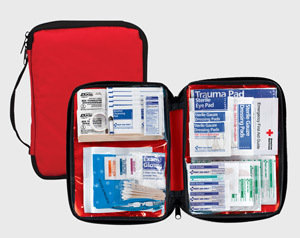 The bright red case is easy to identify in emergencies and the durable case keeps supplies clean and protected. Inside, clear plastic pouches neatly organize the first aid, making it simple to find supplies when you need them. The kit is perfectly sized to fit on a shelf, in a purse or bag, or in a car under the seat or in the trunk. $25 plus $5 shipping. When minutes count, the Personal Safety Pack provides everything you need when the unexpected happens. This ingenious tube features supplies to help with hydration, warmth, weather protection and minor injuries. The pack easily stores at home, in vehicles or at the workplace. They work perfectly as incentives for businesses or groups such as scouting organizations. $25 plus $5 shipping. 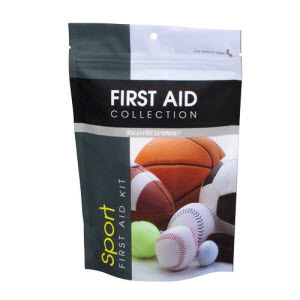 Be an all-star when it comes to preparing for the rigors of sports with the durable Sports First Aid Kit. Designed specifically for sports activities, the kit has everything needed to stay in the game. 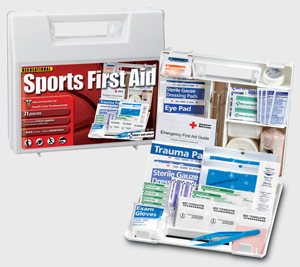 With this kit, you can bring the training room with you in an easy-to-carry rugged case. Along with a full selection of bandages, the kit featues topical antiseptics, tape and an instant cold compress. $25 plus $5 shipping. 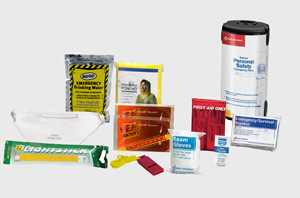 Extend your family preparedness to the maximum with the imaginative First Aid Survival Kit. The durable, ballistic nylon carrying case holds a comprehensive selection of first aid and survival supplies. Neatly organized in individual sections, all contents are supplemented with simple instructions for rendering aid or surviving emergency situations. 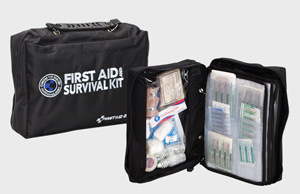 The ultimate First Aid Survival Kit features a convenient carrying handle and stores easily. $120 plus $10 shipping. When you want to get away, take first aid with you in the Deluxe Outdoor Soft Kit. 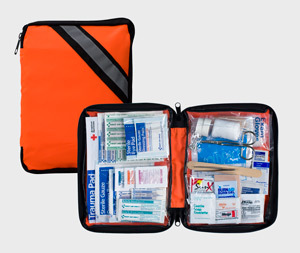 The kit features a rescue orange zippered case with a reflective stripe for high visibility. Inside, clear pouches keep first aid organized and easy to find. 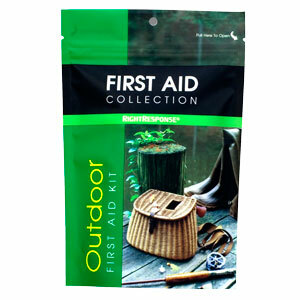 The selection of supplies treat common outdoor injuries from cuts and scrapes to insect bites and minor aches. You'll find other valuable items not found in typical kits, including tweezers and metal scissors. Take this kit along when you're camping, in a boat or RV, or in a backpack while hiking. $40 plus $5 shipping. Businesses can save time and money with the SmartCompliance® cabinet. Smartly organized with patented snap in boxes, the cabinet holds first aid to treat up to 50 people in the workplace. Cabinets are available for the general workplace or food services facilities such as restaurants. The cabinet features the SmartTab ezRefill system, where bright tabs in each box tell you when an item needs to be reordered. $120 plus $10 shipping. 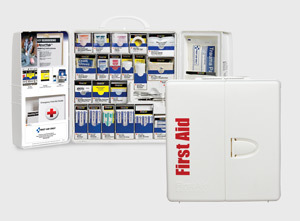 Easily meet the demands for workplace first aid with the 25 Person ANSI First Aid Kit. Compartments keep supplies organized and easy to find, putting the care needed at your fingertips. Ideal for offices, factories or worksites for up to 25 people, the durable kit can be mounted to a wall or stored on a shelf. Each kit is proudly made in the USA, supporting American jobs. $50 plus $5 shipping. 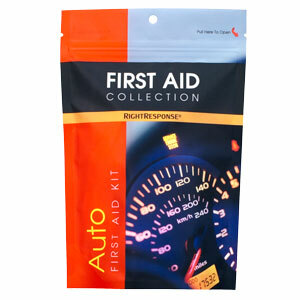 Keep first aid safe and accessible with the 10 Unit ANSI First Aid Kit. The kit complies with ANSI standards for first aid kits and color-coded boxes make it easy to identify the supplies needed. The tough metal case and gasket can take on the most demanding conditions while protecting supplies from water and dirt. The compact kit is perfect for small offices or vehicle fleets. $48 plus $5 shipping. 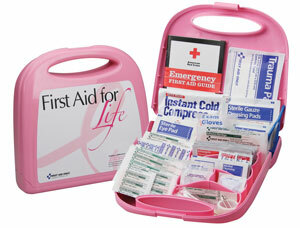 Make a difference twice raising funds with the exclusive First Aid for Life kit! 50% of the purchase price goes to the Frenchglen Education Foundation while at the same time helping in the fight against breast cancer. With every sale of this distinctive pink kit, Right Response will also donate a portion of the sales profits to provide early breast cancer detection to those in need. This is fundraising with a heart for others. The sleek kit features first aid supplies to treat common injuries at home or in the outdoors. $25 plus $5 shipping.